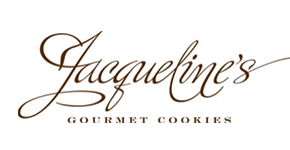 Jacquelines Gourmet Cookies | Favorite Foods, Inc.
Every expectation, every standard for excellence, each desire for delicious taste is surpassed by the superb bakery selections from Jacqueline’s Gourmet Cookies. Founded by Jacqueline Hazel, her kitchen-based bakery is now headquartered in a brand new 55,000sf. NSF Cook & Thurber certified production facility in Salem, Massachusetts. The reason for this growth is simple: Jacqueline’s dedication to create the best tasting, consistently outstanding products that fit the individual needs of Jacqueline’s customers. Foodservice professionals are consistently rewarded with Jacqueline’s gourmet superb quality. By serving gourmet, fresh baked products, you enhance your image for quality and demonstrate real interest in your consumers. That is why Jacqueline’s has become a reliable, easy-to-prepare favorite in so many hotels, fast casual restaurants, catering, cafeteria operations and in-store bakeries. The taste always satisfies. The quality never disappoints.